Jake Blues is just out of jail, and teams up with his brother, Elwood on a 'mission from God' to raise funds for the orphanage in which they grew up. The only thing they can do is do what they do best – play music – so they get their old band together and they're on their way, while getting in a bit of trouble here and there. I guess you could say I have been feeling blue every time this film has been brought up, since I have yet to see it and therefore find it annoying that I will have to exclude myself from the discussion. 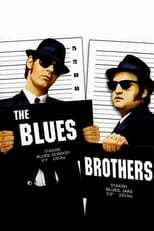 Of course though, what would a movie about blues be without the music.